Sleeping through the night means something different to everyone. A goal, a reality, a far off dream, something to brag about, something other people's children do and most importantly an eventuality. Find me a teenager who doesn't sleep through the night and well into the next day! Some children do it at 6 weeks, some at 6 years but I promise you, they all get there sometime and often when you least expect it. Our sleeping journey was a lot like a seesaw. In the hospital Dylan went 5 hours without a feed - presumably the exhaustion of being born was a little too much for him and I was told I needed to wake him at least every three hours to make sure he was feeding enough. He clearly heard this as by 3 months old the longest he had done was 4 hours in one stint and it was usually hourly from then onwards. I accepted our night time cuddles and to some extent enjoyed them. He didn't always make it back to his crib afterwards as it was a little too often that we both fell asleep feeding. One cold October day, something amazing happened. My clever little boy found his fifth digit - the almighty thumb. That night I woke up every hour from 11pm onwards to check he was still breathing, and when he eventually woke up at 7am I was amazed and confused! A month later and I was confident that my baby was sleeping through the night, I had become cocky with my late nights and somehow felt even more exhausted than when up hourly. The day he turned four months old I had to drag myself out of bed at 2am for a feed and my body was heavy and tired. The next night he added in a 4am feed too and two weeks later we were up every two hours for milky cuddles. My beautiful sleeper was back to being a newborn, feeding at least 12 times in a 24 hour period! What went wrong?! I was tempted to start weaning in the hope that food would fill him up, but also keen to do baby led weaning and wait until 6 months, I was tempted to try controlled crying but worried he was hungry and not ready for the reality. Most of all I wanted to do what was right for my son without having any idea what it was. We got ourselves back into a night feed routine and I learnt that I could function quite well on these little nuggets of sleep. At 5.5 months we started our weaning journey and on the first day, Dylan demolished an entire slice of toast. He was definitely ready and as we had waited, so was his gut. He took to food well trying everything we gave him and enjoying generous portions. His sleep did not improve however and he was still having milk throughout the night. Just after he turned 6 months things changed again. I dressed him for bed one night, and carried him upstairs to the dark nursery. We sat on the nursing chair and I gently rocked as I fed him to sleep - the same way I had since that first nervous night at home. I watched his sleepy eyes close and after he had dropped off I stayed rocking, watching his angelic face relax. After a few minutes I picked him up, ready to put him back in his cot when I saw those big blue eyes open and look at me. This was not the plan! We sat back down again and repeated but again he woke up! Not knowing what to do, I put him down in the cot and headed downstairs to make myself a drink whilst we came up with a plan B.
I got to the bottom, and still silence. Deciding to make the most of it I made myself a cup of tea. Still silence. I drunk my cup of tea in silence and then quietly sneaked up the stairs. I poked my head round the door and saw my beautiful boy curled up, thumb in and eyes tight shut. For the first time, he had put himself to sleep! Knowing he could do it gave us both the confidence and that night he was only up twice. I would hear a little wimper every now and again and then the noise of vigorous sucking as the thumb went in and a little sigh as he fell back asleep. It was so easy! Over the next two weeks I refused to feed him to sleep as we both knew he could do it. Every nap time and every night I would place him down awake and he would sleep! By 7 months he was routinely sleeping 7pm to 8am and I am delighted to say at 20 months we have seen no regression. I can comfortably say that my child is 'sleeping through'. It is nothing to do with my parenting, and nothing to do with his milk. In fact we stopped bedtime milk at 6.5 months and he would have his last feed at 6pm. His sleeping was down to him. 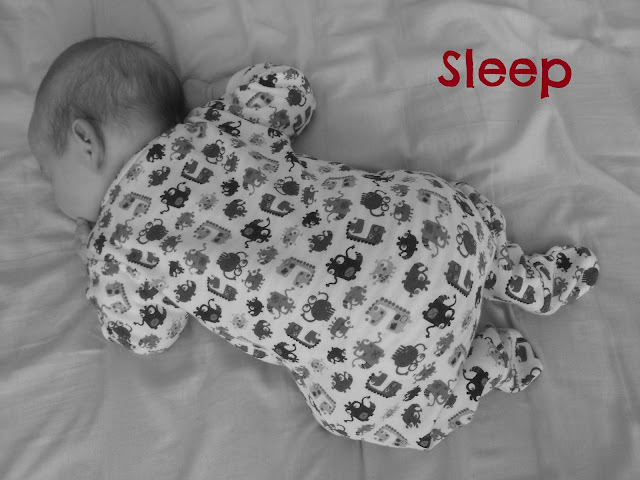 He learnt to do it and he loved it - he still loves his sleep! Archie is already sleeping far better than Dylan did at his age, but we are a long way off my idea of 'sleeping through' and as much as I love my sleep (and I really, really do), every time he wakes in the night and cries out for milk and cuddles, I am reminded that he is my baby and that he needs me. As I hold him close and watch him snuggle into me, we have our own special moments and I will be sad in a way when he eventually stops needing me to help him through the night. Just like Dylan, Archie is without fail, fed to sleep, and although there are plenty of reasons not to get into this habit, I know that just like Dylan, he will eventually find his own way out of it. My quest for a full night's sleep continues, but in the meantime, I am enjoying the cuddles. I love this post. I forget with Mads what her sleep was like in the beginning but I know that LL is sleeping better than her at this stage. We definitely had a period of around five months where she had been sleeping through and then stopped but she soon grew out of it. As you know now Mads is a super duper sleeper and has been for a long long time so it does come eventually- I just only hope that LL is the same. However I am sure they will be very different! I am already getting in 'bad' habits with her- letting her sleep on the sofa next to me during the day and then letting her come in our bed at around 6am. Night feeds don't seem nearly as tiring the second time around, maybe as you know that they don't go on forever!? Charley has sleeped a few nights trough but hes is coming up to a year and has started waking up loads at night again he sleeped trhough a few months ago but now its back to waking up avery other hour. Last night was the worst on in a long time every hour he woke up. I put it down to teething though at the moment. I still have all that to come then as Dylan is still in a cot. I am hoping that he loves sleep enough to stay in the bed once we move him over! Oh gosh, it really does!